Gaslighting: Manipulating a person to make him think that he is going mad. Let's look at some movies with the Scooby Doo theme of having a "man behind the curtain" faking folks out or some explainable situation in something that was thought to be paranormal initially. This delightful Don Knotts movie is a classic favorite from the 60s. He plays a reporter wannabe in a quiet midwestern town who is forced to sleep in a murder house and report about it. This knee knocking delight seems to be about ghosts playing an organ, but becomes something different in the end. This is perhaps the most "Scooby Doo'ish" of the choices. A group of strangers are invited to a scary house on the hill to spend the night for $10,000. The host and hostess seem to be at odds and the house is notoriously haunted. A woman begins getting calls from her dead nephew who doesn't seem to know he's dead. A writer loses her son in a tragic accident and goes away to the Scottish shores to write and heal, but is haunted by a ghost on a lighthouse island. A woman leaves a mental institution and moves to a quiet estate where those around her fear her mind, as does she when she begins to wonder if she's going crazy again. An American woman hoping to escape a bad relationship takes a job as a nanny in England. She goes to a remote estate where a woman and her husband attend to their son, a doll. She isn't sure what to make of it when they leave her alone with the doll and special instructions. Over time, she finds it moves on is own and she's certain it's possessed by their dead son's soul. 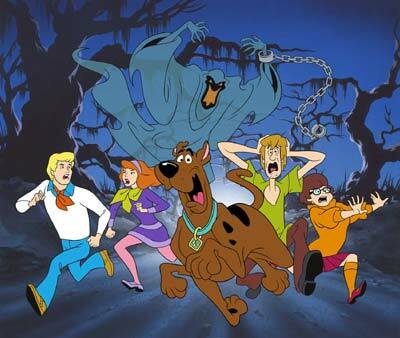 To honor the day, enjoy this - I made a playlist on YouTube of Scooby Doo Episodes - LINK !! !